Trauma to the ACL (anterior cruciate ligament) is a common sports tear that can be debilitating and in some cases career-ending for people in professional sports. ACL is a key knee connective knot that joins the thigh bone to the shinbone. Risk for ACL injury is increased for some sports than for others. ACL ruptures are most frequent in kinds of sports like football, basketball, soccer, ice hockey. It is increasingly common for doctors to direct injured athletes with ACL ruptures toward operation, in hopes to prevent long run effects such as osteoarthritis and menisci tears. However, there is mounting evidence that conservative handling of ACL injuries, including physical therapy, are just as effective in resolving this type of trauma. Furthermore, conservative treatment for ACL injury is reversible, while the surgery is permanent. There are a plethora of experimental studies and reviews that address the topic of surgery vs ACL PT post-injury. The most impressive studies are described below as follows. The first of the two studies depicts the difference between the early post-trauma operational reconstruction of the ligament with the conservatively treated (rehabilitated) post-trauma ACl. Participants were 121 injured athletes with a mean age of 26. The athletes were evaluated at three, six, 12 and 24 months, using outcome measures of pain, function, osteoarthritis measures and other tests. The first and the second group of patients improved knee health over two years’ time. Groups were very similar per se. In more than half of the patients the joint healed up and the surgery was avoided. There was no significant difference between the two groups. In 61% of the rehab group, surgical reconstruction was avoided without compromising results. The research team of people that went for early post-trauma reconstruction did not lead to better results. The follow-up study by the same authors came back to the athletes after 5 years and found no difference between the two groups. However, athletes who received a patellar graft for ACL reconstruction had a higher risk to developing side effects. Five years after treatment, half of the early rehab group did not need the surgery at all. Regardless of whether ACL patients elect to have surgery, or to pursue conservative treatment, physical therapy plays a key role in restoring knee function, increasing an athlete’s chances of returning to play after ACL rupture. 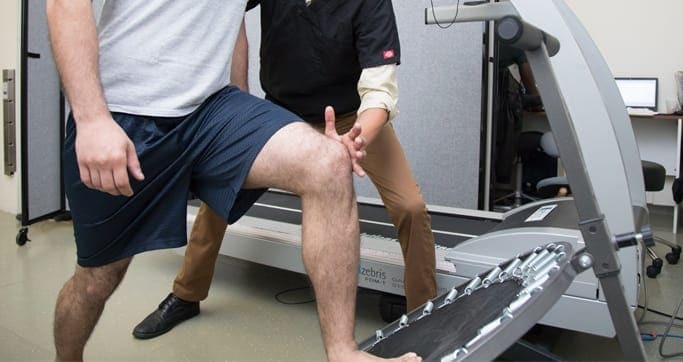 If you have suffered an ACL injury, NYDNRehab in NYC offers some the most technologically advanced diagnosis and treatment strategies in the USA. Before agreeing to ACL reconstructive surgery, visit the sports medicine professionals at NYDNRehab to explore your options. Our team of sports injury experts will give you an accurate diagnosis, and devise a rehabilitation program based on your specific individual needs. If your intent is to return to play with full knee function, contact NYDNRehab today, and see why we are the very best rehabilitation specialists in NYC. Frobell, RB et al. A randomized controlled trial for acute ACL tears. N Eng J Med. 2010;363(4): 331-342. Frobell, RB et al. Treatment for acute anterior cruciate ligament tear: five year outcome of randomised trial. BMJ. 2013; 346:1-12.